Displaced Syrians arriving at a Jordanian military medical outpost on Wednesday near the Jaber crossing. Thousands of Syrians who fled a government offensive in the southwestern province of Dara’a are now at risk from scorpions, snakes, disease and dehydration. [post_ads]At least 15 Syrians have died in makeshift camps near the Jordanian border because of “scorpion bites, dehydration and diseases transmitted through contaminated water,” according to a report published this week by the United Nations Office for the Coordination of Humanitarian Affairs. Twelve of the dead were children; two women and one elderly man also died. More than 320,000 people in the Dara’a region have been displaced by the fighting, according to the United Nations. Most are living in makeshift campsites near the Jordanian border and the Israeli-controlled Golan Heights without adequate shelter, food or water. Thousands are sleeping in the open desert. Temperatures there can climb above 110 degrees Fahrenheit during the day, and then plunge at night. On Friday, Syrian government forces captured the main border crossing with Jordan as part of a deal with rebels in the area. The deal put the government back in charge of the critical transit point for the first time since 2015 but it was unclear whether it would help the displaced people camping on the border. While the exact terms of the deal were not made public, the rebels’ spokesmen said it also called for them to hand over their heavy weapons in exchange for the withdrawal of government forces from some villages. As in previous agreements between rebels and the government, the rebels would be given the choice of remaining in the area and accepting government control or being bused to rebel-held territory in northern Syria. If the deal holds, it would mark a new victory for the government of President Bashar al-Assad, which has gradually consolidated its control of much of the country after routing rebel forces. Holding the Nasib border crossing with Jordan could give the government an additional boost by reopening a key trade route that linked Syria with other Arab countries. The Russians were to guarantee the safety of returning civilians, the rebel spokesmen said, but there was no sign yet that civilians were returning. Jordan and Israel are not allowing the refugees to enter their territory, though both are providing some aid near the border. Jordan, which has taken in about 1.3 million Syrian refugees during the seven-year war, fears it could be destabilized by the arrival of hundreds of thousands more. It closed its border with Syria after a 2016 car bomb attack that killed six members of the Jordanian security forces at a military post on the border. Filippo Grandi, the United Nations high commissioner for refugees, has urged Jordan to consider allowing the new wave of displaced people to enter the country temporarily. 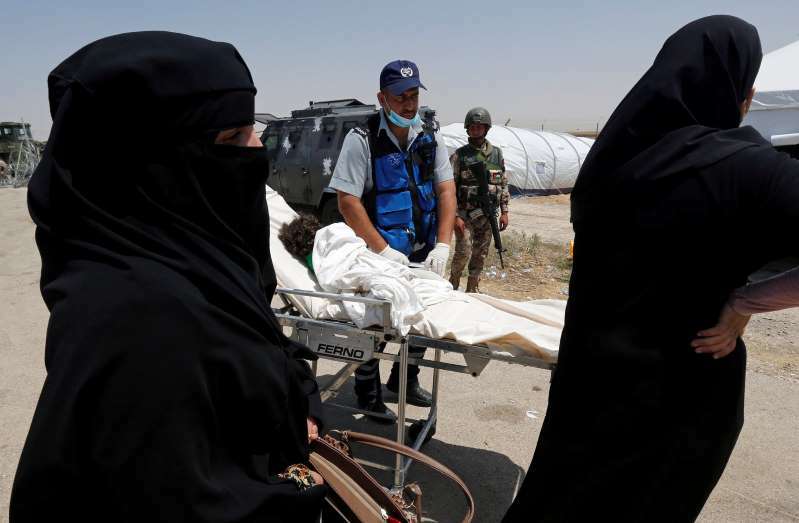 Since June 27, United Nations humanitarian convoys have been unable to cross the border and enter Dara’a because of violence and a lack of security guarantees, according to a statement from the United Nations humanitarian agency. Video taken on the Syrian side of the border shows families clustered around blue tarps or lying on the earth, as soldiers stand guard behind the border fence. The International Rescue Committee has a mobile health clinic in a buffer zone near the border crossing between Nassib, Syria and Jaber, Jordan, where around 60,000 people have gathered after fleeing Dara’a and the surrounding area. The team there — one doctor, one nurse and one midwife — has been providing care for the past three days and has treated at least 50 people. Rachel Howard, the International Rescue Committee’s acting health coordinator in Jordan, said several pregnant women were among those in medical distress who had been referred to them. While the organization has yet to treat any cases of scorpion stings or snake bites, Ms. Howard said that is most likely because they are focusing their efforts on reproductive health. But exposure to the elements was another source of concern. The fighting is inching steadily closer to the Jordanian border. On Friday, Syrian state media reported that government troops had reached the border at Nassib. Ms. Howard said the biggest difference between Thursday and the previous day was that rising smoke was visible on the Syrian side of the border, and the boom of artillery fire could be heard from where she was stationed on the Jordanian side. “We could hear it in the distance,” she said. For those who have fled, there is little to do but wait for a resolution to the battle. The United Nations Security Council met behind closed doors on Thursday to discuss the situation in southwestern Syria. The Syrian government’s attack on the area, with the backing of its ally Russia, violated a cease-fire agreement negotiated last year that deemed the area of Dara’a Province part of a de-escalation zone.